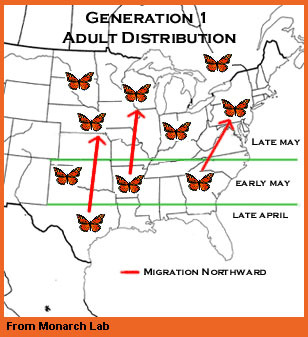 Monarchs move northward throughout the spring. The first monarch generation of the year begins when females that have spent the winter in Mexico lay eggs in northern Mexico and the southern United States beginning in late March. 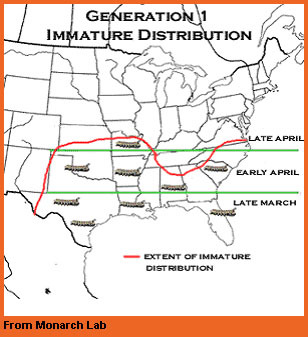 The last generation 1 eggs are laid in late April or early May, farther north. Since it is often cool when Generation 1 larvae are developing, it may take them up to 40 or 50 days, or even more, to develop from eggs to adults, as compared to 25-30 days in the summer. Generation 1 adults emerge from late April to early June. They mate and begin to lay eggs about four days after emerging, and continue the journey north that their parents began, laying eggs along the way. They begin to arrive in the northern US and southern Canada in late May. Like all monarchs, generation 1 begins life on plants in the milkweed family. The most important milkweed species for Generation 1 monarchs in the southern US are Asclepias oenotheroides, A. viridis and A. asperula. Monarchs in Generation 2 are the grandchildren of the overwintering monarchs. 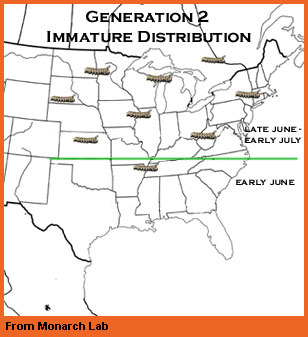 Generation 2 larvae are widely distributed throughout the eastern United States, first beginning to appear in the south in early May, and in the north in late May. Eggs that become generation 2 may be laid as late as July in the north. Those laid in the southern part of the range continue to migrate north. Generation 2 adults emerge in June and July, and mate and lay eggs soon after emerging. Most of those that begin their lives in the south move north as adults, since the southern summers are too hot and dry for their offspring. Those laid farther north probably do not move far, and can use all of their energy to produce as many offspring as possible. Many members of Generation 2 eat milkweed species including A. syriaca (Common Milkweed) and A. incarnata (Swamp Milkweed) as larvae. 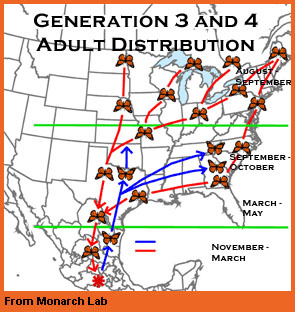 Monarchs in Generations 3 and 4 are the great- and great-great grandchildren of the overwintering monarchs. Generations 3 and 4 monarch eggs are laid throughout the northern part of their range in July and August. Some adults move south in late July and August, and may lay eggs as late as October in the southern part of the US. Some generation 3 monarchs emerge early enough to produce another summer generation. But those that emerge later are different from other monarchs in two important ways. First, they will migrate to and from the overwintering sites in Mexico. Second, they do not reproduce right after they emerge. In response to decreasing temperatures and shortening day lengths at the end of the summer, their reproductive organs remain in an immature state. Instead of mating and laying eggs, they spend their time drinking nectar and clustering together in nighttime roosts in preparation for their long journey south. This delayed maturity is called diapause. Most of the monarchs will remain in this condition until the following spring, when they begin to mate in the overwintering colonies. During September, October and early November migratory adults fly to overwintering sites in central Mexico, where they remain from November to March. In March, they begin to journey north, laying the eggs that will become the new Generation 1 along the way. 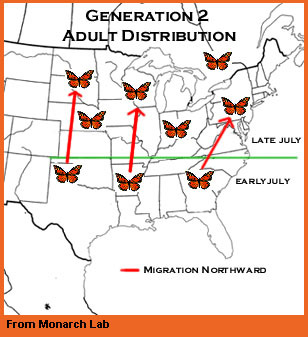 Generation 3 and 4 undergo huge increases in size, taking advantage of the abundance of milkweed and favorable temperatures in the northern US and southern Canada. Check out the lesson plans. Watch the short video segments. Take a Google Earth tour. Learn more about the spectacular migration that millions of Monarchs make each year.